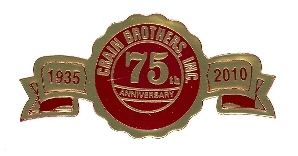 Crain Brothers, Inc. has a world of experience and has dedicated employees who have grown up both living and working in and near wetlands, knowing the hazards associated with working in this environment and developing equipment that is safe and friendly to the environment. Our workforce is uniquely qualified to operate specialized equipment and well-adapted to working in marsh or marine environments. We have in-house pipeline certified welders available for 24-hour service, certified machinery operators, Safety Council certified personnel, and the majority of our force is operator qualified.